Our group of BRAIN editors, sponsors and guests is just getting started — we stopped by four shops, not nearly enough to get a grasp of the bike retailing scene in this city of 1.6 million people with deep ties to French culture, including its love of cycling. But in our first of three days here cycling from store to store, we visited four very professional, well-merchandised locations, and enjoyed a perfect early summer day riding bike paths, bike lanes and shared streets with largely respectful drivers. Our first two stops were two locations of Bicycles Quilicot, a retailer with roots dating back to 1915, when Italian immigrant Louis Quilico opened a store, adding a "t" to the end of his surname to make it look more French. The business was bought by Marc-André Lebeau, a former Canadian junior racer, 11 years ago. We first visited the store on Rue Masson in Montréal, but the business runs four locations — one sells e-bikes only and was acquired in February of this year. The Rue Masson store is the smallest in square footage, but biggest in volume. Most of its business comes from commuters, who make up half of the store's sales. The store sells lots of hybrids. The other half? Recreational road bikes. With so much of its revenue from commuters and recreational road, the business has seen a significant impact from the decline of the Canadian dollar. Prices have crept up on entry-level bikes in the last three to four years about CA$300. "That has had a huge impact on entry-level bikes and customers," said Remy Leduc, store manager. This year, Bicycles Quilicot has benefitted from a mild winter, said Alexandre Hamel-Jetté, assistant manager. Fat bike sales took a hit, but sales and repairs of other bikes took off earlier. "A big part of sales growth in Montreal is commuting," Leduc said. Bicycles Quilicot bought Velo Branche, an e-bike shop, earlier this year. The store caters to an older clientele that often comes in two to three times before purchasing a bike. But known for e-bikes, Bicycles Quilicot kept the name and added an espresso coffee bar so customers can sip on java when they come in to check out bikes. The store, on Avenue Papineau, has a very modern feel and look. Leduc said aside from e-bikes, the store plans to grow its selection of accessories. "In Montreal we're late in the market on e-bikes," said Leduc, especially compared to Europe, but he's seeing growing interest. The e-bike store carries a selection of Felt, Specialized, BionX, Evo and Velec (a Quebecois brand) e-bikes ranging from CA$2,000-$4,000. Next, we visited a store devoted to a single brand — Dealer Tour sponsor Louis Garneau Sports, conveniently enough. The Velo 2000 Garneau store is not owned by the Quebec City-based brand, but is instead a family business, now owned by Sebastien Lucier, who bought it from his father, Michel, a few years back. The store was founded in 1988, and carried a typical array of brands for its first dozen years: Specialized, Norco and others. But 10 years ago, the Luciers decided to focus on the brand named for and run by Olympian Louis Garneau, a Canadian sports hero. "All the other stores, all our competitors, had the same brands we had. We had seen the Trek and Specialized concept stores in the U.S. and we liked those and we thought, here, the best brand for us was Louis Garneau," Lucier, 35, said. 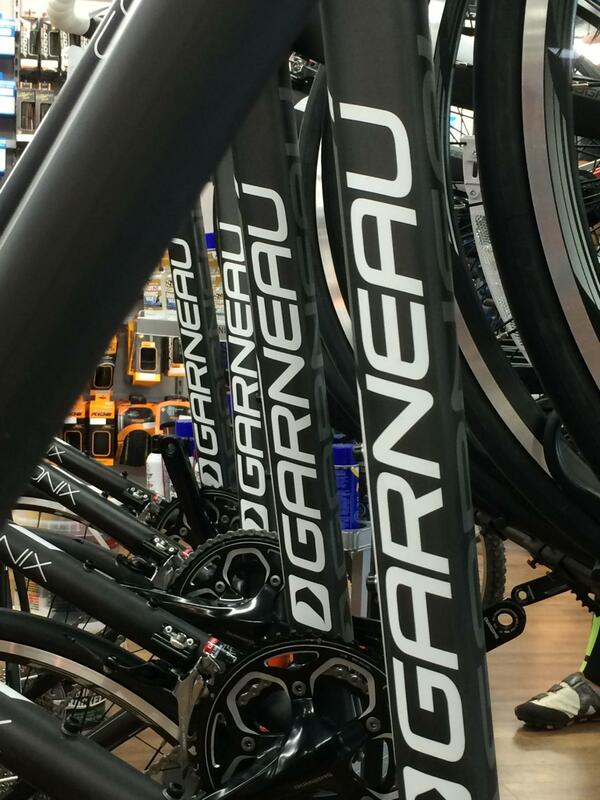 Garneau makes more than enough products to fill the 12,000-square-foot store. The store stocks LG hybrids and kids' bikes (which are not sold in the U.S.) as well as its road, cyclocross and triathlon bikes. Roughly half the store is devoted to soft goods, almost all from Louis Garneau. The LG brand is on a surprisingly large array of products, many rarely seen in the U.S. — the store even stocks LG sports nutritionals. "They make more than enough," Lucier said. "Too much, really. We can't stock it all." Lucier said the focus paid off immediately. For example, before the changeover, the store stocked three or four helmet brands. When the store switched to all Garneau, helmet sales went up 40 percent in the first year. "It was easier for customers to choose," Lucier said. The store also is seeing growth in its indoor training center, which features nine Computrainers. Members can store their bikes at the store for the winter, bringing them out for classes — and getting a tune-up in the spring. Many members pay around CA$1,000 for a winter membership, taking two or three classes a week. The store is expanding the training business more this year with the addition of a sports lab offering VO2 max testing and other services. Lucier also is planning to add a cafe next winter. "Then they can eat here, train here and buy bikes here," Lucier said with a smile. La Cordée serves the average Joe. Our final stop on Day 1 was La Cordée, a four-store operation that blends bicycle sales with a strong offering of outdoor gear and ski sales in the winter. David Tringle, the store's bicycle product buyer, said the three-level store caters primarily to midmarket consumers. "It's the average Joe who comes here," he said. Trek is its main U.S. brand, but it also stocks Devinci, Wilier, Focus and Kona bikes. Another store, La Cordée Boutique, which the company bought last fall, taps the touring and bikepacking market with Salsa and Surly among its most popular brands. The main store boasts almost 12,000 square feet of space for bicycle products and service in a brightly lit and well-merchandized basement including a four-person service center. "We do sell a lot of gravel bikes, but we don't know how much a gravel they see," Tringle said with a chuckle. Most customers buy gravel bikes for the larger size tires and the greater sense of stability the bikes offer on Montréal's rough streets. But gravel bikes are eroding sales of road bikes, he added. As for the season, Tringle said it has been mixed. It got off to a slow start as cold, wet weather kept customers out of the bicycle department. "When we think we have the season figured out, it then flips on us!" he said. La Cordée takes advantage of the winter season when it turns most of its bicycle section into a Nordic ski center specializing in classic and skate skiing. Its other store, La Cordée Boutique, is well known in the area for its alpine touring equipment as well as its Nordic selection, Tringle said. "It's good for us. We can keep staff by giving them regular hours throughout the year," he said. The BRAIN Dealer Tour of Montreal is sponsored by Louis Garneau Sports, Finish Line, PeopleForBikes and Interbike. Wednesday will take riders south of the city center to Allo Velo, Cycle Neron and Cycle Technique. The last day, the tour will stop at five shops within close proximity of the city center including ABC Cycles, Momentum Solutions Velo, Cycles Gervais Rioux, Mountain Equipment Co-Op, and Fitz & Follwell. Follow along and message participants on Twitter via the #braindealertour hashtag. You can also follow along on Facebook and Instagram. Watch for web updates during the week and a full report in the July 15 issue of Bicycle Retailer & Industry News.